In recent years, the cave has established itself as one of the top ecological and adventurous destinations for travel enthusiasts. Nhan Dan Weekly reporter My Anh and her friends recently made an expedition to Dark Cave as a preparatory step in their plan to conquer Son Doong, the world’s largest cave while taking a chance to get in-touch with Mother Nature. In the article below, My Anh has captured and shared her travel experiences as well as her feelings while trekking the cave. Tourists are not encouraged to discover the cave by themselves since there are many risks, including the thick forest and mountainous terrain. By booking a tour run by the Phong Nha – Ke Bang tourism centre, we were provided with adequate protection clothing, heat-tech shirts, heat-tech swimwear, rubber sandals, gloves, socks, cap lamps, and life jackets. The first four kilometres of the trip was quite hard because the road was narrow and sloping with many obstacles along the way. After overcoming sharp large rocks and slippery muddy roads, we got to know why experts from the centre insisted that only rubber sandals were appropriate to cross the forest. In return for our hardship, we were treated with the fresh greenery of assorted plants and exotic flowers. The landscape was so pristine and imposing that it seemed surreal. We reached Thuy Cung cave just as we all started to feel fatigued. However, a jade stream suddenly appeared amid four-sided forest and cliffs which jolted us all awake. The stream runs through the sunken cave, creating a beautiful natural “pool” of cool water. Continuing the trek for around two more hours, an entrance approximately 20 metres wide and 50 metres long appeared in front of us. Dark, deep and hollow, it generated a feeling of inviting but challenging. Here it is, Toi Cave! We camped and cooked dinner together, gathering around a fire we enjoyed delicious hand-made barbeque dishes with hot aromatic coffee. We really enjoyed an interesting and memorable night amid the deep forest and soughing winds under a starry sky without electricity or mobile phone signal. Early the next morning, we started on a six-kilometre trip in the thick darkness of Toi Cave. The path was continuously interrupted by underground springs and swamps. The longest spring was up to 300 metres, it was a couple of metres in depth and icy cold. As we were wearing life jackets, we didn’t have to swim but just avoid reefs to overcome the spring. However, it can challenge the weak hearted as you have to make it through in complete darkness. Although we had imagined the situation beforehand, our team members were flabbergasted by stones which were as big as houses and trucks, as well as the mushroom-like stalactites with diameters of up to several metres. Many sections of the cave are as large as a theatre auditorium with celling’s of up to 80 metres in height. There were also bottomless chasms, which are up to 50-80 metres deep according to our tour guides. There is no need to describe our happiness to see the dim light at the end of Dark cave after six hours exerting to overcome enchanting but difficult obstacles inside the cave. 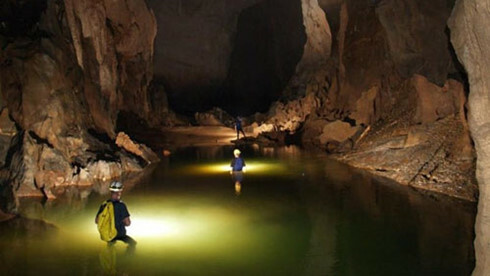 After concluding the tour, visitors can also experience the 400m long zip-line service crossing the Chay River to the front entrance of Toi Cave, mud-bathing in the cave, or kayaking on the river as well as other adventurous pursuits. The expedition to Dark Cave not only satisfied our curiosity and thirst to discover new things but it was also a test for us to overcome our physical and spiritual limitations. Toi, Tu Lan, En, Va and Son Doong caves, are just some of the interesting destinations that are waiting for us to explore.